Do your flowers smell like onions? Yup, that’s because they are onions. I pinned this idea a few weeks back and didn’t think I would actually do it until I had a meal that required these. I bought the green onions to use on a Mexican inspired dish. The onions had an inch left of the root and the white part. All I did was keep them connected with a rubber band and stuck them in a clear drinking glass with some water next to the window in the kitchen. A few days later I realized they actually had grown to the point that they were inching over the top of the glass. My current window plants were past their expiration date so I decided to make a switch. Originally the intention was to put in tulips for the spring, but there was no luck in Home Depot the day we went to get them. For now, I will keep these useful plants in the kitchen growing and for use. Cutting the top off for use leaves them not so pretty and probably diminishes the chance of a flower blooming, but it makes for a great perpetual green onion machine. They grow really quickly and do well with sunlight. 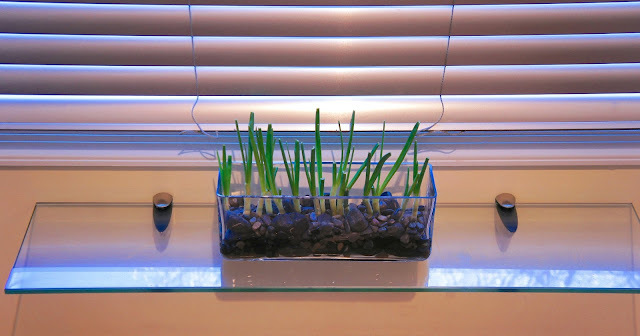 There isn't much to do with them besides putting them in a drinking glass for the roots to grow a bit and transferring them to the decorative glass planter with actual river rocks. Water and watch them grow. During the cold winter months, there is nothing better than seeing new green plants growing. Not only do I have my outdoor green house, but now I have edible green onions in the kitchen. Spring can’t come soon enough, but I am somewhat content for now.